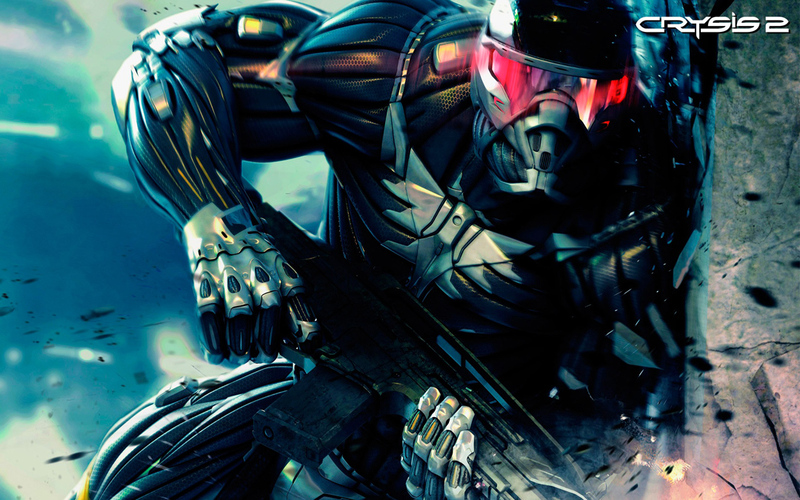 The sequel to one of the more underrated but graphically powerful games in recent times, Crysis 2 has hit store shelves and will be looking to improve upon its first run. Will it be successful? That Sweet, Sweet Eye Candy: As was the case the first time around, Crysis 2 has a large focus on incredible graphics that push the limits and capacities of PCs and dazzle on the Playstation 3 and Xbox 360. The original Crysis had excellent graphics, and it is no different this time around. From the get go, Crysis displays high resolution graphics in addition to extremely sharp environments and outstanding character models. The game is clearly one of the best looking titles in recent years and I am very impressed with the overall graphics. Particularly on PCs (assuming your computer can run it) the visuals can look even better than they do on the home consoles. Unlike many other "pretty" games, Crysis 2 does not have an issue with "pop-ins". However, while it does succeed in that area, I have encountered issues with the occasional framerate drop during heated battles mid-game. At times when there are a multitude of enemies on screen the game can slow down and "lag", as if you were playing online. Although it isn't a very common problem, it can be a bit of an annoyance for the few seconds that it occurs and sometimes can even lead to a death or two. As far as the audio goes, the voice overs in the game are quite good as are the sound effects of the weapons and explosions, but I did notice that the characters who talk during the cinematics tend to speak on the quieter side and force you to turn up the volume on the TV. The Urban Jungle: Crysis 2 takes place in New York City in the near future where aliens have returned to Earth in an attempt to destroy the planet. Not only do savage aliens roam the streets, but a mysterious epidemic and plague is ravaging the city as well. You begin the game having inherited the Nanosuit 2 from Laurence "Prophet" Barnes (a character of the first game). As far as the story goes, I think it can be a little thin and it is not exactly the most descriptive and engaging storyline I've ever seen, but does a decent job of getting you from this place to that place without you wondering "why am I here all of a sudden?" The Nanosuit 2, as was the case in the first installment, is a powerful outfit that endows you with a variety of powers. From super strength to the ability to jump 15 feet in the air, the Nanosuit adds a nice dimension to the typical first-person shooter action that gamers have gotten accustomed to. In addition to his physical abilities, the Nanosuit 2 also has the ability to cloak itself for a small period of time, making you invisible to your enemies (which open the window for some nice stealth kills). Not only that, but the suit can also reinforce itself when it's "Armor" mode is activated, making you vastly more resistance to gun fire and explosions. The two main modes (stealth and armor) are distinctly different and both are quite fun to use, but more importantly it gives players the option to take one path over another. You could cloak yourself as much as possible and stealthily pick off foes, armor up and mow through opposition like a walking tank, or do something in between. I also liked the ability to customize your weapons with laser sights, suppressors, extended magazines and other attachments. Although it is not a customization system of say, Call of Duty: Black Ops or Army of Two: The 40th Day, I thought it added a little to the game as far as being able to alter your weapons as your change engagement tactics. The full campaign is moderately long for a somewhat linear first-person shooter and can span around 10 hours or so depending on how you play the game and how often you die. I was slightly disappointed with the lack of any cooperative play in the game, but I suppose it is not entirely unexpected considering two protagonists in the game does not make much sense in the storyline. Super Soldier Training Grounds: Aside from the typical single player campaign, Crysis 2 also features a variety of multiplayer modes and a community that is surprisingly active despite a number of bigger name titles taking up most online gamers. There are six modes if play in the multiplayer ranging from the typical Free-For-All (Instant Action) and Team Deathmatch (Team Instant Action) to the objective based modes like Capture The Relay (essentially Capture The Flag) and Crash Site (a King of the Hill-like mode). The multiplayer is unlike most typical first person shooters like Halo or the Call of Duty series due to the use of special abilities from the Nanosuit 2. Every player runs at very fast speeds and can also equip "Modules", which are perks that give you a particular skill. The skills are varied and come in three different categories (Armor, Stealth and Power modules) and range from being able to crush an enemy after a power jump or having faster reload speeds. Based off my time with the multiplayer in the game, I can safely say that it is different from anything else out there today. The fact that every player can take a lot of damage before going down and also seem to run at Mach speeds (which makes sniping practically impossible in most cases) can cause some very frustrating moments, but it can be fun to sneak up on a camping enemy with your stealth mode engaged and move in for a swift kill. Rent vs. Buy: This title dropped in price fairly quickly, and I think for a price of around $15-$20, Crysis 2 is a solid investment. It is not the greatest game on the market but its use of the Nanosuit 2 in the campaign and the multiplayer make for a lot of "wow!" type of moments. As well, the campaign has some replay value due to the fact that you can replay missions with different styles of engagement. I would recommend this to any fan of a FPS who would also happen to enjoy stunning graphics and an interesting, albeit fun gimmick that sets the game apart from others.